The books published by SAREM follow. You can download some of them for free in PDF format from this page and also acquire printed copies. If you want to purchase more than one title or copy, you can do it more easily from this other page. Please notify Amelia Chemisquy or Agustín Abba of the payment or transfer. You will later coordinate the delivery of the purchased items with them. 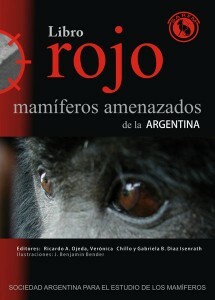 This is the first book dedicated in its entirety to current primatological studies in Argentina. 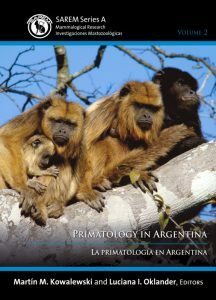 After more than 40 years of continuous work, we have put together a volume that represents most of the research groups studying Argentinian wild and captive primates. We have also included a summary of the primatological research in Argentina from its beginning until the present. This book appears within social and academic contexts related to the establishment and expansion of the Asociación de Primatología Argentina (APrimA) as well as the Sociedad Latinoamericana de Primatología (SLAPRIM), and in parallel with similar volumes edited in Brazil, Peru, Mexico, Colombia, and Venezuela. We hope that this volume will serve to engage students in this discipline, and will provide valuable information in order to build a National Plan for Primate Conservation in Argentina, and consequently, preserve the habitats of our cousins, the non-human primates. This is the first title on SAREM’s Series A, Mammalogical Research. 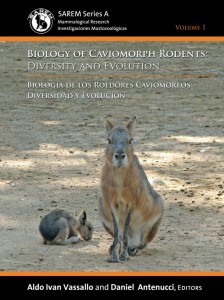 It provides information about the biology of caviomorph rodents, with contributions by 32 experts. 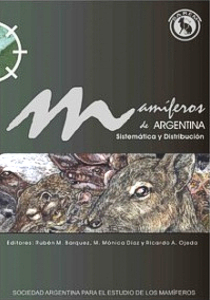 This 360 page book highlights the current knowledge on Argentine mammals, and was thought-out to provide a conceptual basis for future research of both professionals and students who wish to pursue a career in Mammalogy. Included in this book are 386 species from 181 genera, 47 families and 13 orders, with a detailed taxonomy and information on each species’ distribution. This book provides concise information with essential references, author, common name, type locality, distribution by Province and eco-region, and general comments for each species. Agustín M. Abba, Martín R. Álvarez, Rubén M. Barquez, Ricardo Bastida, Claudio J. Bidau, Never A. Bonino, Alfredo A. Carlini, Silvia C. Chalukian, Sebastián Cirignoli, Guillermo D’Elía, M. Mónica Díaz, Luis Ignacio Ferro, David A. Flores, César M. García Esponda, Germán M. Gasparini, Pablo J. Jayat, Mauro Lucherini, Romari A. Martínez, Mariano L. Merino, Marta D. Mudry, Mariela Nieves, Ricardo A. Ojeda, Edgardo Ortiz-Jaureguizar, Pablo E. Ortiz, Ulyses F.J. Pardiñas, Javier A. Pereira, Pablo G. Perovic, Diego Rodríguez, Eliana R. Steinberg, Pablo Teta, Diego H. Verzi, Bibiana Vilá, Sergio F. Vizcaíno and Gabriel E. Zunino. Field guides to marine mammals have a basic purpose: to provide information on the lives and identities of species, so that those who are interested in life in the sea can understand what they are looking at, why a particular species is where it is, and what is it doing there. An appreciation of these aspects of marine mammals’ life is fundamental to understand how humans should interact with these animals, and how their environment should be managed. 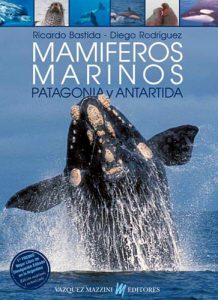 The world-wide development of whale- and dolphin- watching as a touristic activity has already reached the largely pristine coastal waters of southern South America and Antarctica, and the publication of this guide book is, therefore, very timely. Research workers and lay persons alike will derive much from this new edition with updated and improved information. This book is essential for identifying 50 marine mammal species of the region, and includes 205 color photographs, 90 illustrations and 54 distribution maps. The authors are well-known, recognized experts in the field of marine mammalogy and marine ecology, who have published many scientific papers and books related to marine ecosystems. 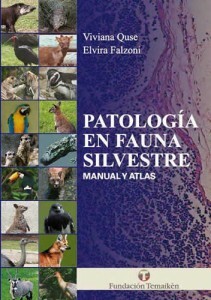 The first manual and atlas in Spanish, published in Argentina, about disease in wildlife. A book for both study and reference, aimed at veterinarians, biologists, pathologists and specialists in wildlife. It showcases macroscopic lesions observed during necropsy, and histopathology images from species such as Puma, Bengal Tiger, Pudu, Tapir, Argentine Black and White Tegu, Toucan and Rhea, among others. It contains a chapter devoted to a Necropsy Protocol and the procedures to be applied in mammals, birds and reptiles. Also included are 30 pathology records where macroscopic and microscopic findings related to several infectious, parasitic, metabolic and toxic diseases are described and illustrated with more than 350 high quality photographs in color. The companion histopathology Atlas (included) features photographs of microscopic lesions in normal tissues compared to the disturbances caused by various diseases. A must for specialists and students of disciplines related to Veterinary Medicine and Biology. Two out of ten species of Argentine mammals are threatened. In other words, 81 out of the 385 native species are currently under some kind of threat. Three species are extinct: the red-bellied gracile mouse opossum, the Falkland Islands wolf, and the giant water rat. Main threats to Argentine mammals are loss, fragmentation and degradation of their habitats, hunting, conflicts with people derived from our productive activities, illegal trade, and diseases. 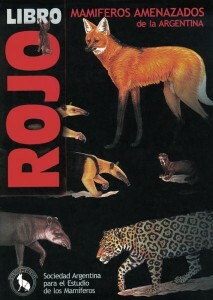 More than 70 authors have contributed to the 2012 Edition of the Red Book of Endangered Argentine Mammals. The book includes, for each species, their common and scientific names, conservation status (both National and Global), threat factors, comments, and original illustrations by Benjamín Bender for some of the species, as well as lists of related websites, conservation projects and specific bibliographical sources. Almost a quarter of the species of Argentine mammals are threatened (i.e., 83 out of 353), as reported in the 2000 edition of the Red Book of Threatened Argentine Mammals*, edited by the SAREM. This represents 14 more species threatened, compared to the numbers of the 1997 report on threatened mammals of Argentina. The main threats to mammalian conservation are related to an accelerated reduction and deterioration of several habitats (subtropical and temperate forests, native grasslands and shrublands in arid and semi-arid climates), mainly due to human activities and illegal hunting (e.g., several species of armadillos). Part of the threatened species are endemic to Argentina; others occur in neighboring countries with a shared ecosystem (Altiplano with Bolivia and Chile, Chaco with Bolivia and Paraguay, Valdivian Rainforest with Chile, Yungas with Bolivia). Other threatened species have a broad distribution throughout South America, Central and southern North America (e.g., giant river otter, ocelot, jaguar, tapir, giant anteater). The Red Book is an important source of information to organizations in charge of administration, conservation planning, and management of biodiversity, such as National and Provincial Agencies, and non-government Agencies. 353 species of Argentine mammals were categorized for this edition, including their common and scientific names, information on their conservation status in Argentina and by the IUCN, main threats, and general comments. This edition also includes references to individual species and different taxonomic groups (e.g., marsupials, rodents, carnivores). *Gabriela B. Díaz and Ricardo A. Ojeda (eds). 2000. Libro Rojo de mamíferos Amenazados de la Argentina. 2000. Sociedad Argentina para el Estudio de los Mamíferos, SAREM. 106 pp.